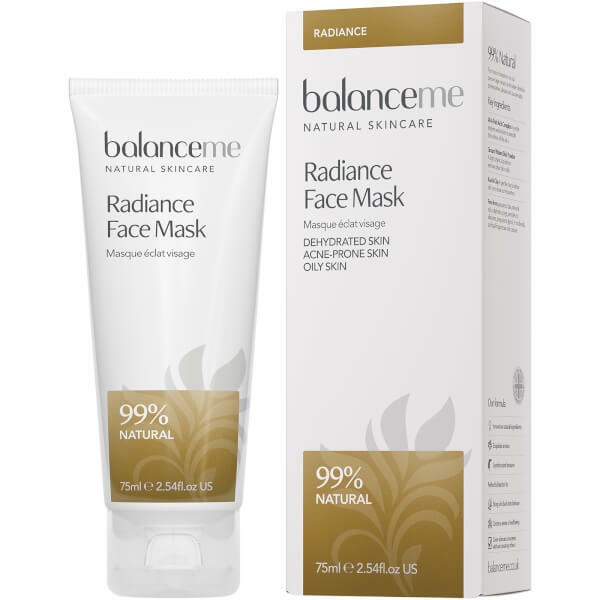 Treat dull complexions to the Balance Me Radiance Face Mask; a multi-beneficial, five-minute formula that works to replenish moisture and restore a radiant glow. 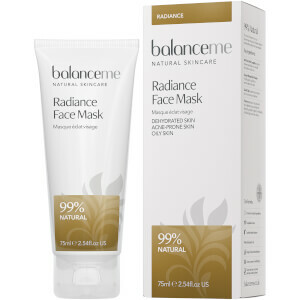 Synergising Ground Walnut Spheres and a Fruit Acid Complex, the 99% natural mask delivers a gently exfoliating action to buff away dead skin cells and eliminate impurities, revealing a smoother, more refined complexion with enhanced luminosity. Kaolin Clay effectively clears pores, whilst Rosemary and Lavender Oils leave skin rejuvenated, revitalised and deeply refreshed. Smooth over face and neck and reveal a brighter, more youthful skin in five minutes. Rinse off. Aqua (Water), Kaolin, Glycerin (Vegetable), Caprylic/Capric Triglyceride, Prunus Amygdalus Dulcis (Sweet Almond) Oil, Cetearyl Alcohol, Glyceryl Stearate, Cetearyl Glucoside, Juglans Regia (Walnut) Shell Powder, Tocopherol (Vitamin E), Aloe Barbadensis (Aloe Vera) Leaf Extract³, Cymbopogon Martini (Palmarosa) Leaf Oil¹, Lavandula Angustifolia (Lavender) Flower Oil¹, Pelargonium Graveolens (Rose Geranium) Flower Oil¹, Citrus Aurantium Amara (Petitgrain/Bitter Orange) Leaf/Twig Oil¹, Angelica Archangelica (Angelica) Root Oil¹, Anthemis Nobilis (Roman Chamomile) Flower Oil¹, Rosmarinus Officinalis (Rosemary) Leaf Oil¹, Cananga Odorata (Ylang Ylang) Flower Oil¹, (AHA Fruit acids complex:) Sodium Lactate (and) Sodium PCA (and) Sodium Glycolate (and) Sodium Citrate (and) Sodium Malate (and) Lactic Acid (and) Glycolic Acid (and) Malic Acid, Sodium Stearoyl Lactylate, Chondrus Crispus (Carrageenan), Tetrasodium Pyrophosphate, Benzyl Alcohol, Dehydroacetic Acid, Citric Acid, Limonene², Linalool², Geraniol², Citronellol². (¹) natural pure essential oil, (²) naturally occurring in essential oils, (³) certified organic ingredient.